Ever hear of Boccie Ball? I'm not quite sure how popular it has become here, or how popular it is in other parts of the world. 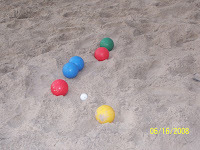 Growing up in an Italian family, I was exposed to the game of Boccie Ball at a very young age. Every gathering from Little Johnny's christening to Sunday afternoon get togethers under the big shade tree, included a game of Boccie. But, no children could play. You could watch, follow along, but not say a word--not even make a sound--you sneezed, you were gone. Sometimes, Boccie could make or break the day. They took that game seriously. Ever see the game? It consists of eight balls about the size of a softball, but a bit heavier, and one small white ball called a pallino--we always called it the "jack"--still do. The balls they used when I was kid were a kind of ceramic. The balls we have today are plastic balls with some water inside to give them some weight. The object of the game is to throw your balls as close to the jack as you can to get points. I think maybe they played to 21--we never quite get that far. Today, Boccie doesn't quite monopolize our family get togethers. Our staunch Boccie players are long gone. 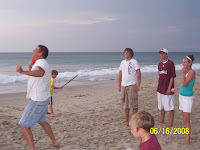 For my family, Boccie ball has become a family play time. We're not as strict, and the rules may change a bit every time, but we make it so all can play--down to the youngest. As I said there is the jack--which someone will throw--usually the youngest go es first. Then everyone has 2 bigger balls of the same color. We each take turns throwing our balls trying to get them as close to the jack as possible. The person with the closest ball gets the point, 2 points if both of your balls are the closest, and gets to throw the jack. We play up to 10 points. Sometimes the youngest don't quite make it that far. This game can be very fun for preschoolers as long as you keep it light. It's a great form of exercise, throwing and walking(or running if your between the ages of 3-5). It's fun for the whole family and it's a great way to make those little guys feel just like everyone else. Remember, it's for fun. It's okay if they laugh when your about to through your ball, or keep running in circles as you try to concentrate, or even throw the jack 3 inches in front of you. In my eyes, if they're having fun, so am I. So get out there and, "PLAY BALL!" No. I have not really heard of this game before. But it looks interesting and what I get from your post is that water filled balls will definitely give some more exercises for preschoolers.